New Delhi: Gold on Thursday recorded its steepest fall in over two months and lost Rs800 to Rs28,140 per 10 grams, on frantic selling by stockists on weak global trend and sluggish domestic demand. 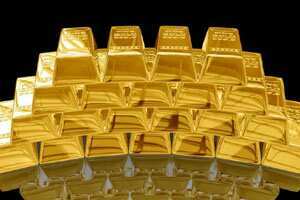 Gold had plunged by Rs835 on 5 October. In addition, reduced offtake on the domestic front due to the end of the marriage season also weighed on the yellow metal’s prices here. On similar lines, silver tumbled by Rs3,200 to Rs52,600 per kg, on fall in demand from industrial units and silver coin manufacturers. Gold in global markets, which normally sets the price trend on the domestic front here, tumbled by $54.40 to $1,576.50 an ounce and silver by 6.10% to $28.96 an ounce in New York on Wednesday night. On the domestic front, gold of 99.9 and 99.5% purity took a plunge of Rs800 each to Rs28,140 and Rs28,000 per 10 grams, respectively. Sovereigns followed suit and traded lower by Rs100 to Rs23,200 per piece of eight grams. In line with a general weakening trend, silver ready nosedived by Rs3,200 to Rs52,600 per kg and weekly-based delivery by Rs3,215 to Rs53,200 per kg. Silver coins also dropped by Rs3,000 to Rs59,000 for buying and Rs60,000 for selling of 100 pieces.